Alain Duran, FIU Ph.D. Candidate, started working on the ecology of coral reef fishes in 2003 supervised by Dr. Rodolfo Claro as part of his undergraduate thesis at University of Havana. He obtained his bachelors in 2007 and worked as a research assistant for two years in the Marine Biology Department of the Institute of Oceanology, Cuba. 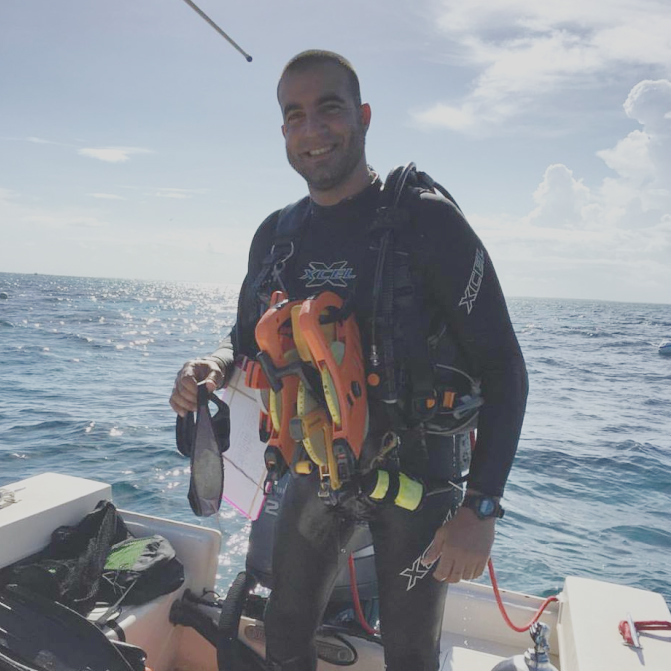 In 2013, he received his Master’s in Biology at FIU with Dr. Ligia Collado-Vides and Dr. Deron Burkepile, focusing on the seasonality of macroalgal recruitment on coral reefs and how herbivory and nutrient limitation affects macroalgal recruitment patterns. Alain started his Ph.D. in the Burkepile Lab in 2013. His dissertation research focuses on the context-dependent nature of herbivore-algae interactions. He is examining how factors such as structural complexity, sedimentation, and seasonality impact how herbivorous fishes can control algal community dynamics.